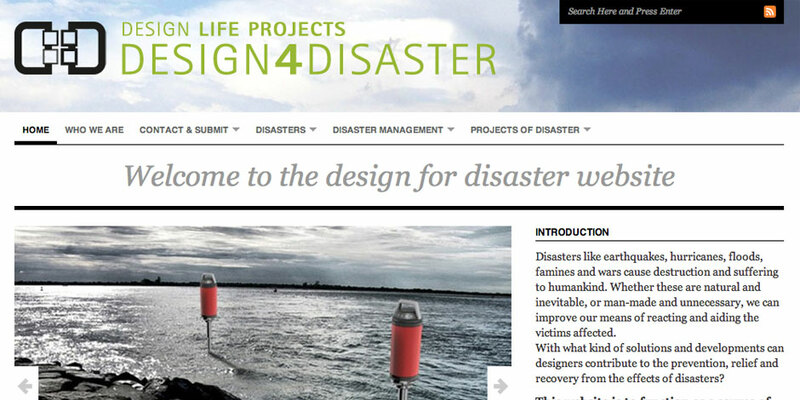 Work: design4disaster is initiated by econcept – agency for sustainable design and consulting and ecosense – media & communication. Anyone interested is invited to participate in the content of the website. Approach is possible both directly or via submit. You can write comments relating to the articles. Such messages can contain e.g. a designer offering his abilities to aid in the event of a disaster, or an aid organization asking for advice on a specific problem. If you would like to add a design proposal, an article or any information to the website yourself you have to send it to us first, via the contact section. We will read and eventually edit your article and then set it onto the website. You can also give us a hint to any design project or information you think should appear so that we can take care of it. The website approaches designers who offer their ideas, organizations who are interested in gaining from these ideas, companies who want to involve in realizing proposals and anyone gathering information on the topic.